Sixteen stylish candles, each bearing a paua shell and the name of a family member of the bride’s and the groom’s family, were arranged on either side of the main wedding candle on the altar and lit one-by-one. A beautiful ceremony which involved the families and created lasting memories for all concerned. 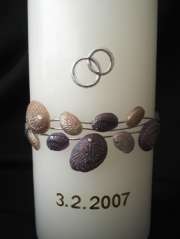 The family candles were made to order, in sizes ranging from 300x65mm to 125x65mm. The main candle measures an impressive 400x95mm (almost 2kg in weight, burn time approx 375 hours). Please contact us to discuss your own unique wedding candle arrangement.